Hanging about in the Sacred Valley | Where to next? Derrick spotted them first. 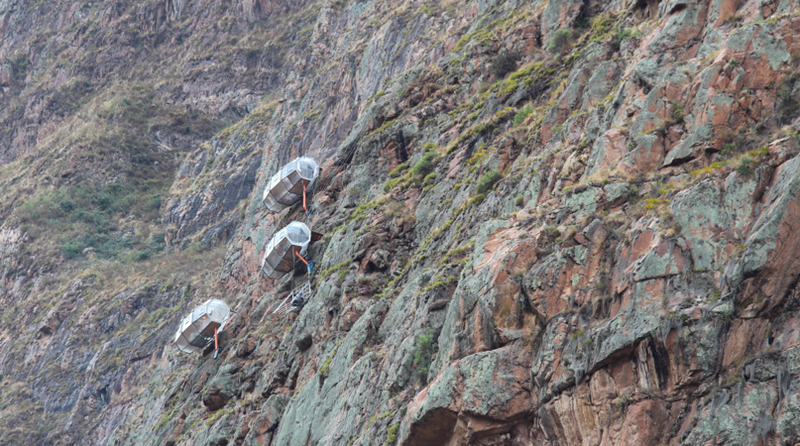 Three glass capsules suspended far above the Sacred Valley in Peru. Our driver pulled over and we got out to take pictures and marvel at these unexpected structures. Herbert, guide for our day-long tour of the valley, explained that they were hotel rooms that guests climb up to. 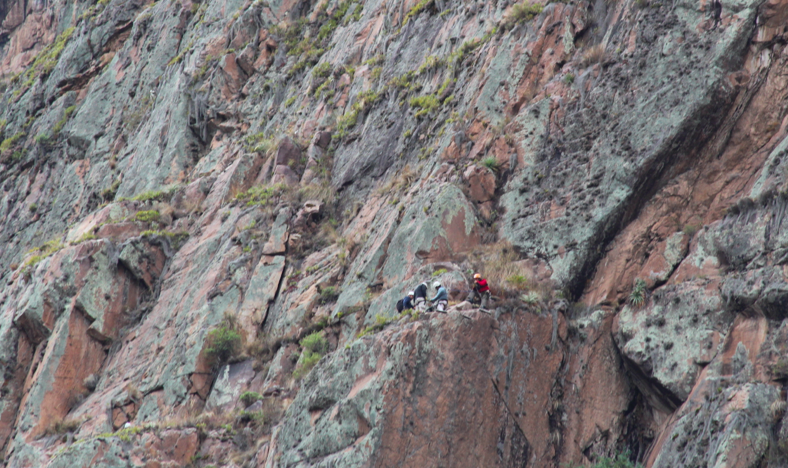 We even saw some hikers making their way there. It took quite a bit of searching on Google to find out more about these aerial cocoons. Run by an outfit called Natura Vive, the skylodge is part of a package deal that can include ziplining, mountain climbing, dining and sleeping under the stars. The modules measure 24×8 feet and are suspended about 300 metres up the mountain. Each tube can sleep four, and also has a dining room and private bathroom. Check out Natura Vive’s website. Their prices look very competitive. Go on. Do it! You can bet it’ll be on my to-do list the next time I’m in Peru. While I don’t mind a bit of zip lining, you’d never get me up that mountain to sleep in that capsule. It’s never going to happen! I’ve read a bunch of reviews on this hotels, including many by people who ARE afraid of heights. Surprisingly, they all said it didn’t bother them. So maybe you could move it a notch or two up the list. Not in my lifetime or in my dreams. It looks way too precarious and scary for me. But I can easily imagine you and Poor John spending the night on a mountainside tucked up in one of these. But that’s why we’re all different and like different things. Me: queen size bed with feather doona and pure cotton sheets with feather pillows. I’ll eat in the first Michelin star restaurant I see. You: clinging to a rockface in a bubble cooking up a storm. I loved seeing them. One day I tell you, one day! I would love to stay there! just saw them last week when we were on our way to M.P. I’d love to stay there too. It looks so amazing. Great views, of course, but . . . . Shared this with my 8-yr-old. Cool! These people are crazy! How could you sleep wondering how well they are attached? I have vertigo just looking at them but how wonderful to see them. Oh I’d be crazy along with them. I don’t mind climbing up if I have plenty of time. But I’d prefer to have a helicopter to get me down.